Baise – the city in the Guangxi Zhuang Autonomous Region is noted as a place of history – from both a very long time ago and modern China. Discovery of a Paleolithic Age hand ax in some 800,000 years ago in Baise in 1970s surprised anthropologists and rewrote the history of human civilization in Asia. About 80 years ago, the Chinese Seventh Army was establishing a revolutionary base and Soviet regime in Baise along the Youjiang River. On Dec 11, 1929, Deng Xiaoping and other revolutionaries launched the Baise Uprising, among the earliest battles in the fight against the ruling Kuomintang. A Baise Uprising Memorial Hall commemorating the event that opened in 1999 is now listed as a national key “revolution scenic spot”. The city has since pioneered “red tourism” to become a famed resort through a program called “footprints of Deng Xiaoping”. Baise now is the key city among the 12 national “red tourism” scenery areas. In 2009, the city held events to commemorate the 80th anniversary of the Baise Uprising and set off a new surge in red tourism, hosting 10.3 million visitors that year who generated 4.4 billion yuan in revenues in city tourism, increases of 59 percent and 46 percent respectively. More than half a century, after he led an uprising in the city, Deng Xiaoping was again crucial to Baise when he issued the 1986 instruction to “explore Pingguo aluminum”. The modern city of Pingguo within Baise has since risen along the Youjiang River due to its bauxite reserves of 780 million tons, nearly half of the country’s total. In addition to Pingguo Aluminum, major producers today in Baise include the companies of Yinhai, Longlin, Huayin and Xinfa. Together aluminum producers make more than 70 percent of industrial profits in the city. Baise’s alumina production now totals 5.8 million tons. The city also produces 600,000 tons of electrolytic aluminum and 400,000 tons of deep-processed metal. The city is also a sub-tropical agricultural center, an international tourist destination and a logistics hub. Its 2009 GDP is estimated at 45 billion yuan, an increase of 13.5 percent, with fiscal revenues totaling 5.69 billion yuan, an increase of 3.17 percent. Urban per capita disposable income reached 14,680 yuan last year, an increase of 11.5 percent, as rural net income hit 3,100 yuan, an increase of 10 percent. Investment in fixed assets in 2009 totaled 53 billion yuan, a surge of 63 percent. Seven ethnic groups live in Baise, including the Zhuang, Han, Yao, Miao, Yi, Gelao and Hui, with the Zhuang ethnic group comprising for 80 percent of the population. In addition to their distinctive clothing, the various groups retain their unique folk arts illustrated by spectacular events like the Longlin torch festival of Yi ethnic group, the Tianyang Buluotuo tourism and culture festival, the Tiandong mango celebration, the Zhuang opera extravaganza, the Lingyun tea festival and the Youjiang dragon boat festival. Buluotuo Zhuang brocade, north Zhuang drama and Yao drum dancing are all now listed as Intangible Cultural Heritage by the State Council. As early as 800,000 years ago in the Paleolithic era – or Old Stone Age – Baise’s Youjiang Valley was a center of human activity. More than 200 ancient human remains have been unearthed in the city since 1973. 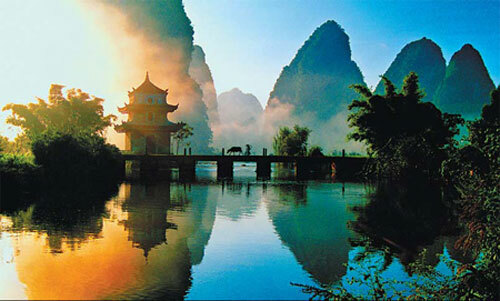 The city has become a new tourism destination following the other Guangxi cities of Guilin and Beihai. Named as “China’s Outstanding Tourist City” in 2007, it has five 4A scenic spots and a number of agricultural tourist attractions. In 2008, Baise renovated infrastructure in Guixi and four other counties, while 300 million yuan was invested last year in improving the infrastructure in villages in Debao, Jingxi and Napo counties. This entry was posted in Travel and tagged Baise, Guangxi. Bookmark the permalink.